A new tube map has started appearing in London Underground stations, and there’s a lot of changes to this edition. Most notable is what’s not on the map — a long purple line that should have marked the launch of the Elizabeth line. But what’s been added is a clearer way of showing when tube stations on different lines are within walking distance of each other. Although a lot of Zone 1 is omitted as you’ll have dotted lines all over the place turning the map into a spiders web. Also, the stations shown have to meet a set of criteria that includes stations less than a 700m or a 10minute walk apart, where there is an easy, well-lit, signposted walking route and where making the change opens up additional travel options. Showing walking distances for connections only between different lines does means one of the more famous “it’s easier to walk” options, between Holborn or Leicester Square to Covent Garden is not shown, as it would double up the Piccadilly line and be even more confusing. London TravelWatch says that it has been pressing TfL and rail operators for a number of years to show on their maps where passengers can make easy and useful interchanges between stations, most notably in its 2015 Interchange Matters report. The interchanges will also be appearing on the rail network maps as well – showing options such as a 6 minute walk between Putney and East Putney stations enabling journeys between Wimbledon and Richmond. The addition of the dotted walking lines also cleans up one aspect of the map, where stations have been shown as connected, when in fact they’re a short walk from each other – such as West Croydon or Clapham High Street. The biggest change though is around West Hampstead where the connected stations have been more accurately represented with the walks between them, but also the lines have had a kink added to make the separation clearer. One missed opportunity is that at Canary Wharf they continue to show the DLR and Jubilee line stations of the same name as being close to each other, whereas anyone who knows the area knows to use Heron Quays DLR instead as it’s a much shorter walk. The use of a paler grey for the zones also seems to make the map look a cleaner, and a few subtle changes have been made to the design, namely the layout of the tram lines, a curve at New Cross, and a small gap added between the Overground and Underground lines along the routes to Richmond and Watford Junction. In addition, boat pictograms have been added at Canary Wharf, Westferry and Woolwich Arsenal to better reflect the interchange capabilities that exist with river services. 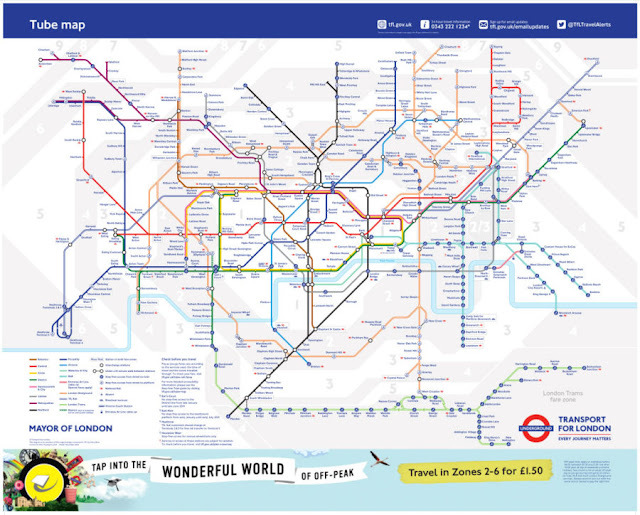 And that’s a reminder, that technically, it’s not a tube map, it’s a diagram, even if everyone* calls it a map.